Memcached can speed up database driven dynamic web site. It must be deployed within trusted network where vm01 and vm02 clients may freely connect to our server. You need to type the following commands on vm03 having an IP address 192.168.1.12. In Linux and UNIX system services are configured using various text files located in /etc/ or /usr/local/etc/ directory tree. 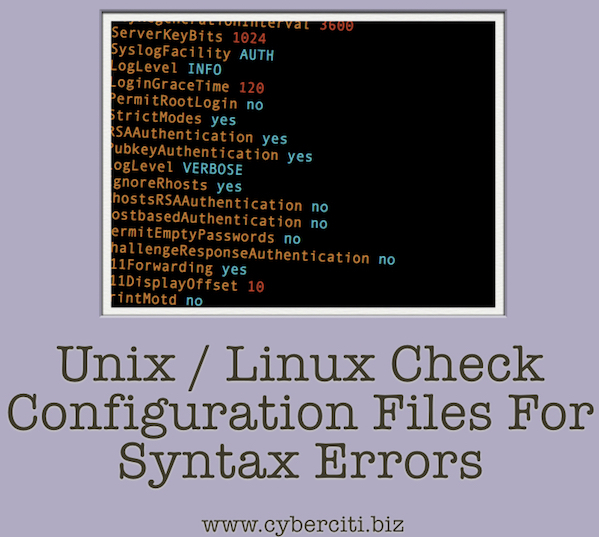 A typical server system could have dozens of configuration files.You can check your configuration files for syntax errors without starting the server and validate all settings. In some cases, it is possible to to check the sanity of the specific data (such as keys) or directories (such as /var/lib/cache/). Text files are easier to manage remotely. You can use ssh and a text editor. If there is an error in configuration, the server may not start. It may result in a disaster. This post explains how to quickly find out a syntax error for popular servers and test configuration file for syntax errors. Nginx is a lightweight, high-performance web server/reverse proxy and e-mail (IMAP/POP3) proxy. It runs on UNIX, GNU/Linux, BSD variants, Mac OS X, Solaris, and Microsoft Windows. According to Netcraft, 13.50% of all domains on the Internet use nginx web server. Nginx is one of a handful of servers written to address the C10K problem. Unlike traditional servers, Nginx doesn’t rely on threads to handle requests. Instead, it uses a much more scalable event-driven (asynchronous) architecture. Nginx powers several high traffic web sites, such as WordPress, Hulu, Github, and SourceForge. sar output can be used for identifying server bottlenecks. However, analyzing information provided by sar can be difficult, so use kSar, which can take sar output and plot a nice easy to understand graph over period of time. A repetitive strain injury (RSI) is occupational overuse syndrome, non-specific arm pain or work related upper limb disorder. RSI caused from overusing the hands to perform a repetitive task, such as typing, writing, or clicking a mouse. Unfortunately, most people do not understand what RSI is or how dangerous it can be. You can easily prevent RSI using open source software called Workrave. Securing your Linux server is important to protect your data, intellectual property, and time, from the hands of crackers (hackers). 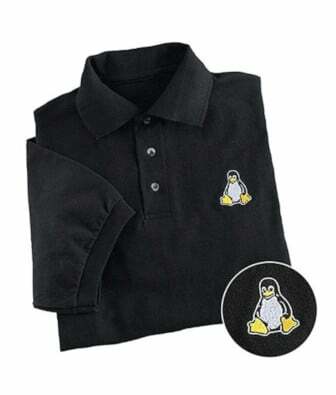 The system administrator is responsible for security Linux box. In this first part of a Linux server security series, I will provide 40 hardening tips for default installation of Linux system. Internet has revolutionized the way online users can shop and avail banking services like internet Banking from anywhere, anytime without visiting bank. But, how safe is your money with online net-banking which allows to carry out money transfer? Companies and in some case individuals lost anywhere from $10,000 to $500,000 dollars because of a single malware infection. The cyber crooks are targeting innocent MS-Windows user. If you are concerned about how best to protect yourself from this type of fraud, use Linux LiveCD for online banking and avoid Microsoft Windows at all cost. Celestia is a real-time visual space simulation astronomy program. It is a cross platform, open source software and released under the GNU General Public License. NASA and ESA have used Celestia in their educational and for interfacing to trajectory analysis software. It allows users to travel through an extensive universe, modeled after reality, at any speed, in any direction and at any time in history. Celestia displays and interacts with objects ranging in scale from artificial satellites to entire galaxies in three dimensions using OpenGL. It is a perfect software for astronomer, educator, student, and teacher for astronomy purpose. Red Hat Enterprise Linux v5.4 has been released and available via RHN for immediate update. The new version includes the kernel-based virtual machine (KVM) virtualization, next generation of developer features and tools including GCC 4.4, a new malloc(). Also included clustered, high-availability filesystem to support Microsoft Windows storage needs on Red Hat Enterprise Linux. BIND 9 is an implementation of the Domain Name System (DNS) protocols. named daemon is an Internet Domain Name Server for UNIX like operating systems. Dynamic update messages may be used to update records in a master zone on a nameserver. When named receives a specially crafted dynamic update message an internal assertion check is triggered which causes named to exit. An attacker which can send DNS requests to a nameserver can cause it to exit, thus creating a Denial of Service situation. configuring named to ignore dynamic updates is NOT sufficient to protect it from this vulnerability. This exploit is public. Please upgrade immediately.